In 1982, a sponge diver found an early Bronze Age Wreck just 60 meters away from the east coast of Uluburun, where is 8,5 kilometers away from the southeast of Kas. 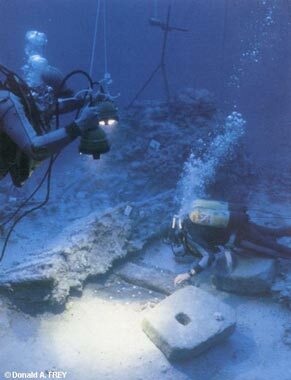 After the studies that started in 1984 and from approximately a thousand dives made in 11 years, A unique cargo has been salvaged which was lost before the century around 1400. 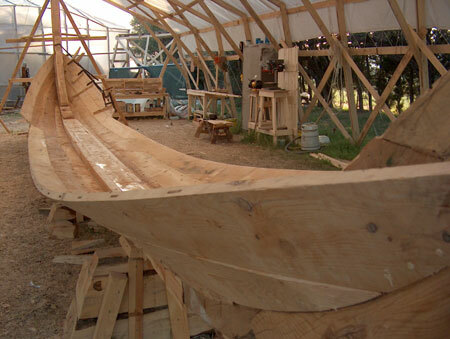 The ship that was approximately 15 meters long and been made from cedar tree was in three parts in the depths. The stern of the ship was lying in 44 meters, while her bow lies in 52 meters and her cargo lies in 61 meters. 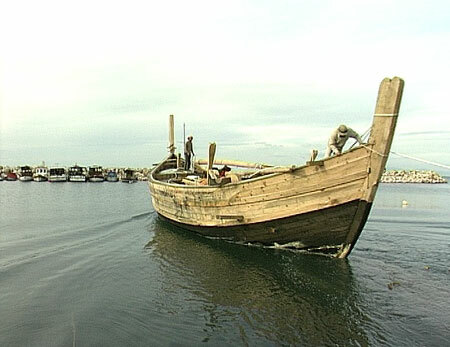 The dendochronological studies made on the cedar tree have been revelaed that Uluburun ship sunked in 1300 before century. The ship's length was 15 meters, width was 5 meters and it is been guessed that she was carrying 20 tons cargo. The main cargo of the ship were 10 tons of copper ingots and 1 ton of tin. And also there were 150 clay pots, bronze tools, ostrich eggs, seals (the most improtant is the one that belongs to Nefertiti), small statues, 10 pitos and 24 stone anchors that weights 3,3 tons. The two of this anchors were 21.9 kg and 25.9 kg which were used for anchoring while the others were used as ballast probably. Her possible route was to Aegean from Cyprus or from Syria-Palestine coasts. The cargo was especially consists of raw material, but there was also products. 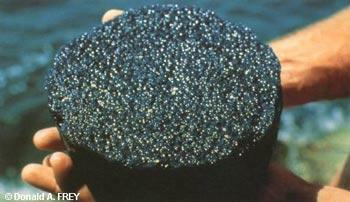 Over 150 cobalt, turquoise and lavander colored raw glass ingots were thaught to be coming from Syria-Palestine coasts. These glass ingots were the oldest and intact known ingots. Also in the unique archeological artifacts, there were cedar tree and black African tropical black trees which called "Abanoz" by the old Egyptians. The other raw materials were consisted of whole and cutted ivories, hippopotamus teeths, shells of a special kind of sea snail thaught to be used in incenses, turtle shells thaught to be used as the voice box of the music tools, and ostrich eggs which were used as pots. 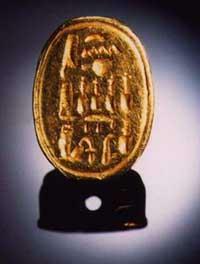 The oldest glass ingot in the World. There were maden products other then the raw materials in the ship. At least in the two of the nine huge pots, there were ceramics and artifacts thaught to be used by hanging on the walls that were maden in Cyprus. 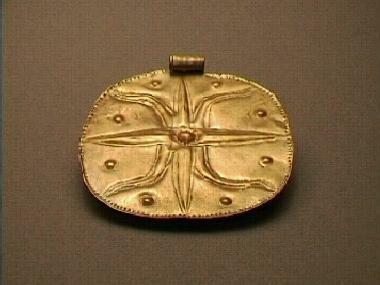 The Kenan jeweleries were consisted of silver bracelets, foot bracelets and gold pendants. 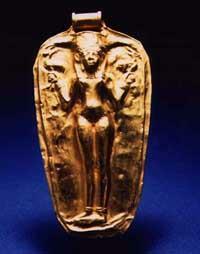 The source of a gold chalice without a grip was unknown. There were agate, gold, porcelein, glass and amber beads in the cargo. There were Kenan, Miken and probabaly Italian swords with the bronze guns, arrows and spears in the ship. There were almonds, figs, olives, grapes on the ship for eating or carrying in the ship. The fishing net weights and things used in the repair of the nets found on the ship states that they were fishing on the ship. Although the nationality of the ship was hard to understood, it is believed that it comes from Middle East. The studies show that it was produced in Kenan or Cyprus style. Cedar tree was used in the production of it. The wood mounted together with the "passing in each other way". 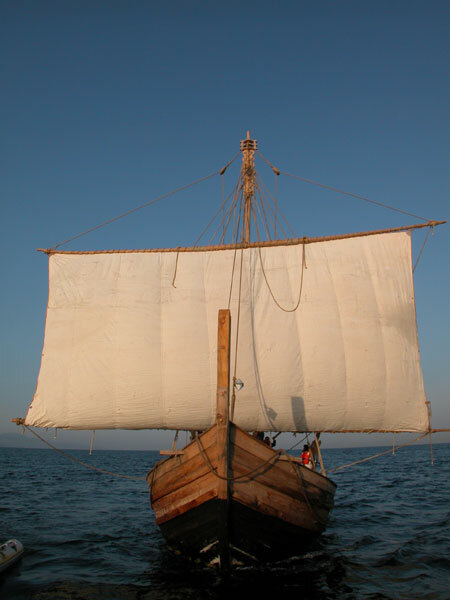 The same technique were used in the Greece-Roman ships one thousand years later than the Uluburun ship. Instead of todays classic techinque of building the skeleton first, the outside of the ship produced first and then the skeleton made inside it. 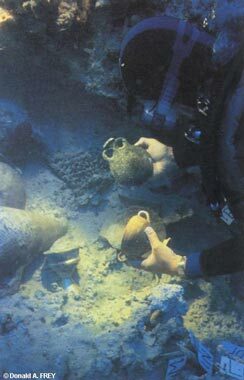 The artifacts that have been salvaged are being shown in Bodrum Underwater Museum. 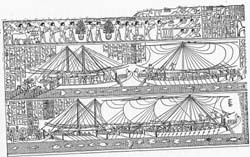 Hatshepsut's fleet in Punt, 1500 B.C. 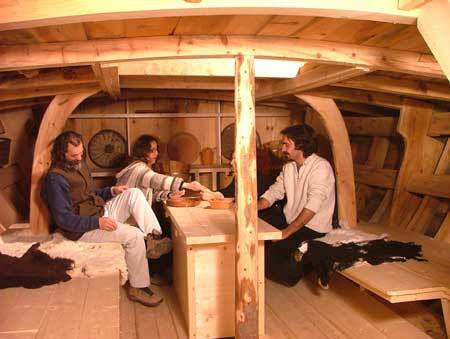 A model of the Uluburun ship has been produced by the research group 360 degrees and they sailed with it living in the conditions of that era.